One bedroom apartment with lots of natural light, 10 foot ceilings, private entrance, sunroom, living room, small kitchen, large bathroom, walk-in closet and washer/dryer. 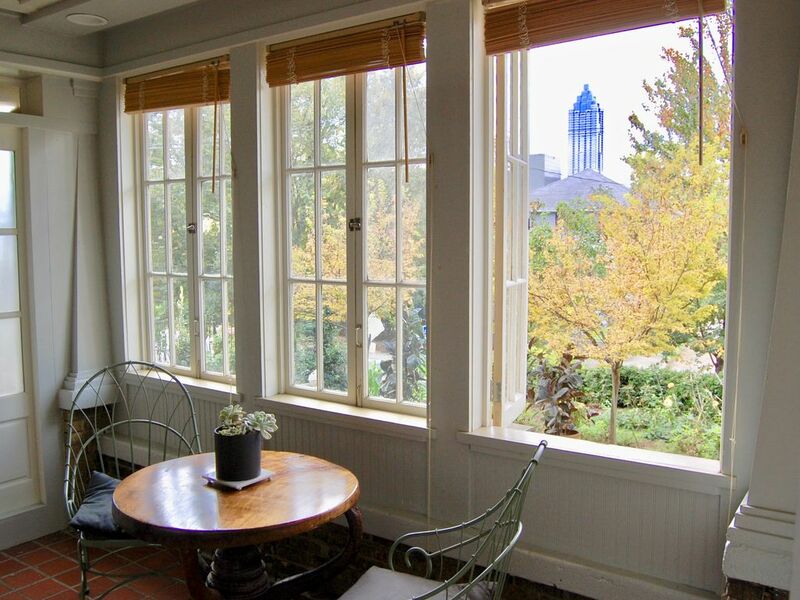 Sunroom overlooks front garden with downtown skyline views. Kitchen is open to living room which has french doors to sunroom. Bedroom is large with queen size bed and laundry in walk-in-closet. There is gated parking available and plenty of street parking. This apartment is on the first floor of a 100 year old house in the most diverse neighborhood in Atlanta - Historic Old Fourth Ward. There's plenty of free street parking if you park 20 ft from crosswalks and 15 ft from fire hydrants. We have one spot available in our gated driveway behind the house that there is a remote on the coffee table. If you park in the rear, please park to the right of the red french doors in front of orange curb. Please mention any problems you may encounter as soon as possible so we can address them. My husband and I have been together for 24 years and in this neighborhood for 20 years. We renovated this 100 year old house into a duplex with in-law suite. We are self-employed and work together on residential renovations. We enjoy gardening, cooking, camping, hiking, biking and community building. This house was perfectly located in the most diverse and historic neighborhood. Being in a transitional area made it one of the most affordable properties in Atlanta. The neighborhood has changed quite a bit in the past few years but we still love it. Built in the early 1900's it features 10 ft. ceilings, lots of windows provide a lot of natural light, Hardwood floors and large spacious rooms. Perfectly located within walking distance to downtown, stadiums, aquarium, parks, restaurants, shopping, bars and nightlife. Sugar, coffee, salt, pepper, eggs, vegetable oil, bread, butter, milk, cereal, juice, etc. There's plenty of free street parking if you park 20 ft from crosswalks and 15 ft from fire hydrants. We have one spot available in our gated driveway behind the house that there is a remote on the coffee table. If you park in the rear, please park to the right of the red french doors in front of orange curb. Please mention any problems you may encounter as soon as possible so we can address them. I know everything there is to know about sheets. Yes... a set expert... and I have no idea what little bit of heaven they used to make those sheets! Loved them. Also a big plus, as a woman traveling alone with late hours, parking in the gated lot was ideal. Everything and I mean everything was perfection. So clean! I literally would love to just come stay for NO reason. Patrick was very understanding when I had to call him the first night because my cognitive ability wasn’t exactly up to par due to exhaustion. He took the time to help me get into the suite as if I as a child without being irritated or condescending. I really really loved it. And I’m super picky! Location was perfect and the private suite was perfect. I would recommend friends and family to stay here. Look forward to booking a future stay. The place was perfect for the convention I was attending. Wonderful experience again! Already booked for the summer convention. Really lovely! A perfect size and well stocked for an extended stay. Great location to be close by my family when we visited. Neighborhood in one direction was a bit shady, but in the other direction seemed just fine. Really quiet and dark during the night-very peaceful. Thank you for hosting us!